Another point of view is that those of a progressive bent in 2012, had they magically existed in 1912, would have likely followed the leftist causes du jour. Ditto conservatives. So what was the progressive doctrine in 1912 that today's liberal can be fairly sure he'd have fervently believed and agitated for? 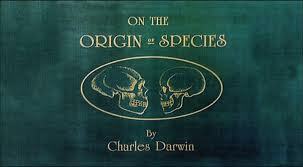 Darwin's 1859 work landed in the Western conscience like a rock heaved into a pond. Nothing would ever be the same. The idea that such social ills as insanity, mental retardation, and psychopathy were heritable began to seep into the popular mind. One reason was Francis Galton (cousin of Darwin), who coined the term 'eugenics' and wrote tirelessly about it for decades. The retarded and insane, a burden on the private and public purse, were having retarded and insane children. The stupid and dysfunctional poor were having many more children than the intelligent and functional rich. (In the U.S:) South and East European immigrants, less intelligent and functional, were hurting the racial stock of the country. However they may ring in our ears today, these ideas once enjoyed mainstream legitimacy. Eugenics' cast of supporters indicates it was even more widely accepted than man-made global warming is today. 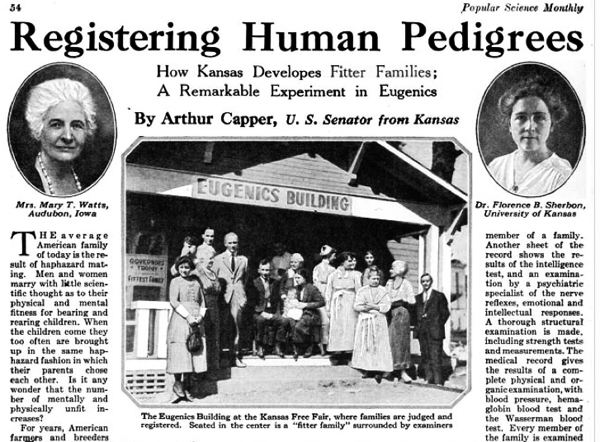 The American Eugenics Society's members included scientific faculty from Harvard, Yale, Stanford, and Columbia Universities as well as philanthropic heirs and heiresses of some of the biggest corporate dynasties of the day. 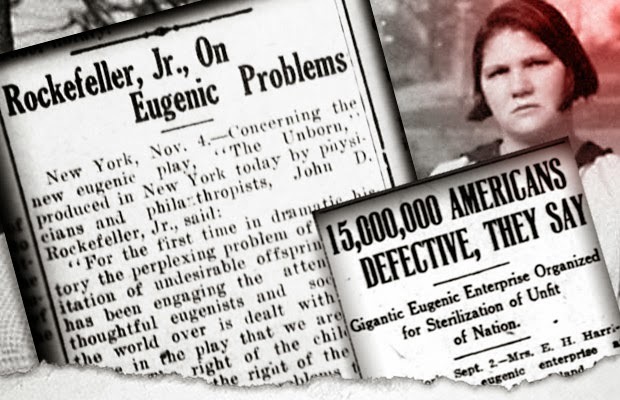 Eugenics research was supported by the Rockefeller Foundation and the Carnegie Institution and promoted by several Nobel Prize winning scientists (among them Linus Pauling and Joshua Lederberg). 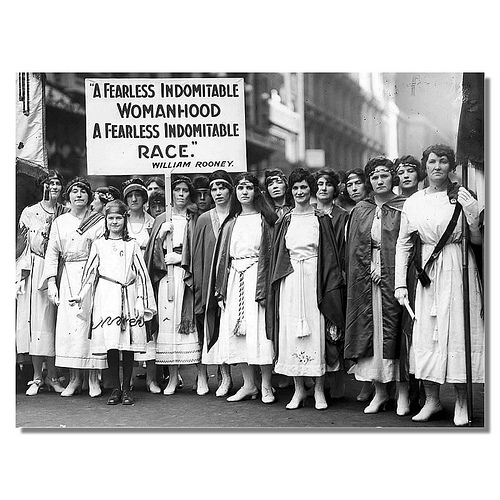 Teddy Roosevelt, Alexander Graham Bell, and Margaret Sanger were supporters. It's been noted that the social reformers of the late 19th century had a sort of missionary zeal. The new factory system had led to a rural exodus, cities now swollen with poor families piled up in filthy conditions. Crime was rampant. Hygiene, public education, birth control were just a few of the remedies sought by Progressives. 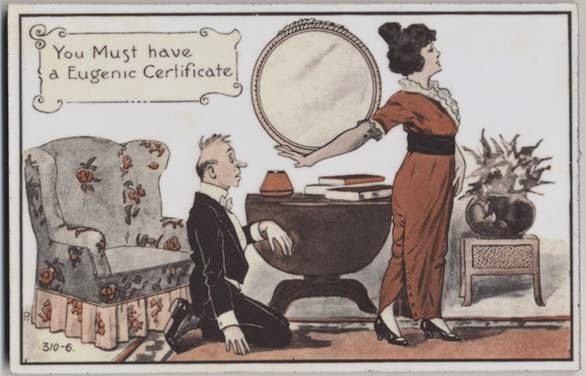 Eugenics was one more tool in the reformer's kit. 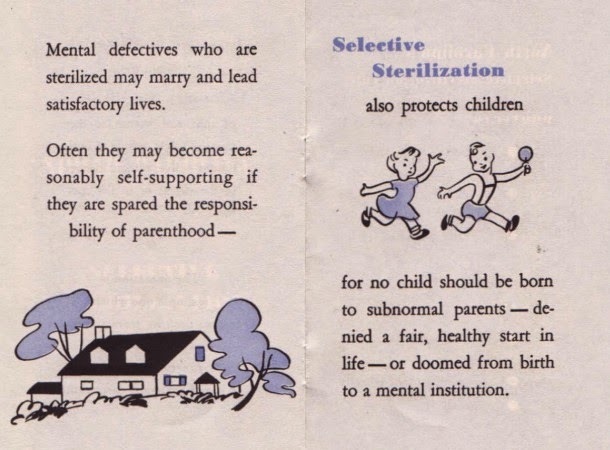 The first coercive sterilization law in the U.S. was famously passed in Indiana in 1907, whose goal was “to prevent the procreation of confirmed criminals, idiots, imbeciles, and rapists” by sterilizing them. Why was this demographic so pro-eugenic? He suggested that a possible solution would be to levy a tax on children, payable by their parents, which would deter the reproduction of the poor more than that of the rich. This suggestion was premised on the assumption that the rich were in general better endowed with the genetically desirable qualities of intelligence and character than the poor were. Decidedly, the notion of the heritability of character traits led to some interesting policy notions on the part of our forebears. 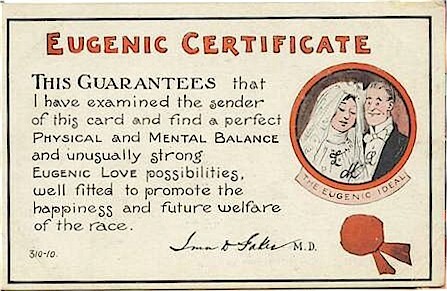 5) The end of Eugenics? A critical year was 1969, in which the American Eugenics Society ended publication of its journal Eugenics Quarterly and replaced it with Social Biology, ... In 1972 the American Eugenics Society changed its name to The Society for the Study of Social Biology and dissociated itself from eugenics. Today 'priding oneself on having a social conscience' seems to entail exactly the opposite. It has become fashionable to impute the shortfallings of the lower classes to the prejudice, callousness, lack of understanding on the part of the upper classes. All 'educated and professional men and women' seem to think so. So who is right? To what era belongs the moral high ground? (1) Lynn, Richard. 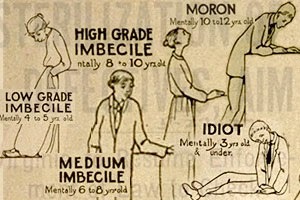 Eugenics: A Reassessment. Westport, CT: Praeger, 2001. (2) Broberg, Gunnar. Eugenics and the Welfare State: Sterilization Policy in Denmark, Sweden, Norway, and Finland. East Lansing: Michigan State University Press, 1996. (3) Dowbiggin, I.R. Keeping America Sane: Psychiatry and Eugenics in the United States and Canada, 1880-1940. Ithaca: Cornell University Press, 2003. (4) Largent, Mark A. 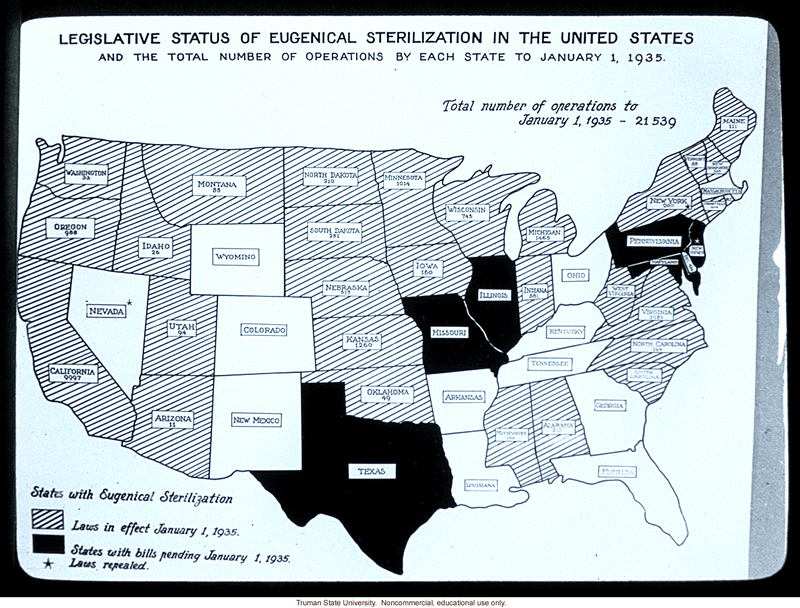 Breeding Contempt: The History of Coerced Sterilization in the United States. New Brunswick: Rutgers University Press, 2008. (5) Thomson, Mathew. The Problem of Mental Deficiency: Eugenics, Democracy, and Social Policy in Britain C.1870-1959. Oxford: Clarendon Press, 1998. 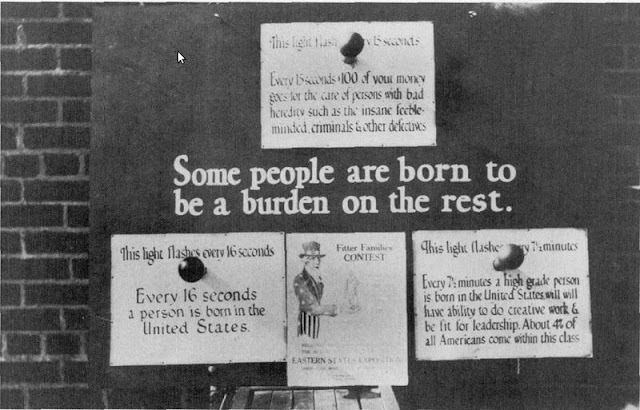 While eugenics wasn't necessarily associated with the holocaust specifically until significantly later, the association of eugenics with Nazi Germany in general did taint the field during the era. William Shockley in an interview with William Buckley mentioned that he did a study on the acquisitions of texts on eugenics by the Stanford University Library and apparently they basically stopped ordering them after Hitler came to power. Thanks for the link B.B. The NS did taint the movement in the 1930s, I remember reading in Broberg's book that many Scandinavian eugenicists thought Hitler was deranged, although quite a few were members of the German Race Hygiene Society. Because that association (eugenics = Nazi Germany) did eventually become gospel, it's tempting to wonder what would have happened had the German atrocities never come to pass. Would the rest of the West have retained this interest in aggressively 'cleansing' the racial stock? Would all these sterilization programs have continued, would this be considered utterly mainstream today instead of a perverse pseudo-science?